People always want to know why things are the way they are. It’s a natural part of being human, to try to figure things out. When it comes to sickness, disabilities, and other challenges, people want to know: Why is this happening? They ask things like: What did I do to deserve this? or Is God punishing me for something I did or something my parents did? These are the same questions that the disciples asked Jesus when they encountered a man who was born blind. Hear the words from the gospel of John, chapter 9. Jesus’ disciples had the same point of view that most people do today. It’s a question of cause. They were asking, “What caused this man’s blindness?” The most important thing to them was the cause of the disability, because they thought that if they could determine the cause, then they could surely avoid that type of behavior, sinfulness, or thinking. And they would warn others to avoid it as well. Knowing the cause is a good thing, but it’s not the most important thing to know. 3 “Neither this man nor his parents sinned,” Jesus answered. “This came about so that God’s works might be displayed in him. Jesus gives the answer. 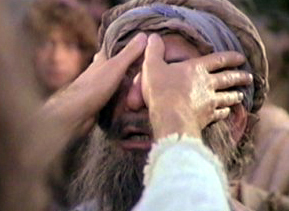 The reason for the blindness, Jesus says, is so that the work of God might be displayed in this man’s life. Both questions answer the question of “why” something happened. But they are vastly different questions. Cause describes what factors led to the circumstance. Purpose describes the reason for the circumstance. And God has a purpose for all things. And that’s the answer to everything that happens to Christians. If you are a follower of Jesus Christ, you can claim the promise of Romans 8:28. Yes, there are a variety of causes for everything that happens in life. We should learn from them. Yet the most important thing to consider is the purpose. When you consider the events of life, look deeply and see clearly that God wants to work in and through your life to do some amazing things. Ask yourself, “What is God’s purpose in this?” Seek Him! God wants to use your life to show you and others just how amazing He is, and that you should put your trust in Jesus Christ, our Healer and our Savior. When you put your trust in Jesus, you can spiritually see! How have you seen God’s purposes at work in your life? I think we could have more peace if we do like you say and focus on the purpose of circumstances, rather than the cause. Thank you for writing this. It makes much sense to me. Romans 8:28 is my life’s verse. God’s perfect timing is the key to understanding. He works on His time table not ours. As we trust and obey (the theme of all the books of the Bible) we begin to get a glimpse of how God works in our lives. As difficult as it seems to be, we must lead a surrendered life and keep the Lord as our first priority. We can ask Him why, but as in Job’s case, He doesn’t have to explain.